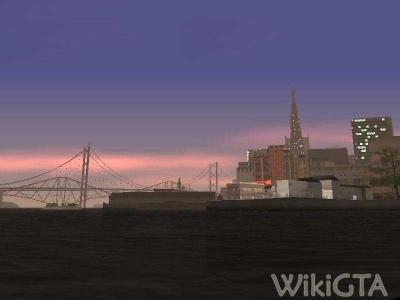 San Fierro is a city in the state San Andreas, on the West coast of the United States. The city is based on the city San Fransisco. Like the name 'San Fransisco' is derived from the saint Fransiscus, the name 'San Fierro' is derived from the (apparently non-existent) saint Fierro. Fierro is a Spanish name, but it can also mean 'Iron' of 'Fiery', making it 'The Iron Saint' or 'The Fiery Saint'. San Fierro is known for it's loose and alternative hippie-culture, the steep streets with cable cars, the smog of downtown and of course the Gant Bridge. Downtown San Fierro consists of the neighbourhoods Downtown and Financial, containing the skyscrapers and other tall buildings like the Big Pointy Building and the Zombotech Research Center. The police department and several stores like ZIP and Victim are also located here. Downtown is connected with Tierra Robada and Las Venturas thanks to the Garver Bridge. The Esplanade, a promenade with a magnificent view of the San Fierro Bay, runs around the North ans East side of downtown. Several docks for freight ships, leisure boats and military vessels are connected to the Esplanade. The famous Pier 69 is located north of the Esplanade. At the west side, the promenade ends with the historical Battery Point, a former fort. Nowadays, the fort is used as a nightclub and is called the Pleasure Domes. The Chinese population of San Andreas has gathered in the Chinatown next to downtown, the largest Chinese community of the world after China. The Triads, a local Chinese gang, have a big influence in the Chinatown of San Fierro. Gang related incidents are not uncommon in this neighbourhood, although the triads are not a violent gang. Calton Heights, the highest part of San Fierro, is located North of Chinatown. This exclusive neighbourhood consists of luxurious Victorian houses, inhabited by the more wealthy class of the city. The famous Windy, Windy, Windy, Windy Street connects Calton heights with Financial. Juniper Hill, Santa Flora, Palisades and Paradiso, the greener parts of the city, are located next to Calton heights. A highway runs from Juniper Hollow across the Gant Bridge to Bayside. At the other side of the city, you'll find Kings and Queens, the center of the gay pride movement in San Fierro. Hashburry, icon of San Fierro and home of the last hippies and other alternative lifestyles, is located more South. Among others, a tattoo shop, a Sub Urban and the Hippy Shopper can be found here. Next to Hashburry, bordering the Pacific Ocean, lies Ocean Flats, a flat middle class neighbourhood. Garcia, where you can find Zero's RC Shop, is located at the other side. The Avispa Country Club is a large golf course in South San Fierro. An observation centre is located on Missionary Hill, from where you have a nice view of the city. Doherty still bears the scars from the earth quake in 1988, as Doherty suffered major damage during this earthquake. Several blocks are ruined, although work is done to redevelop the area. Doherty contains a Driving school, a fire department, Cranberry Station and theWang Cars showroom. Doherty borders the industrial sector of the city. Apart form the Esplanade, Doherty also has several docks for freight ships. A rail road for freight trains leads from Cranberry Station to a dock with a large crane, which can be used to export and import cars from a docked ship. The city also has a military port, called Easter Basin. An aircraft carrier is docked here in 1992. The airport of San Fierro, Easter Bay Airport, has only one runway. You can book flights to both Los Santos as Las Venturas. The industrial park Foster Valley is located at the south end of San Fierro, next to the highway and near Mount Chiliad. This page was last modified on 10 November 2012, at 12:09.